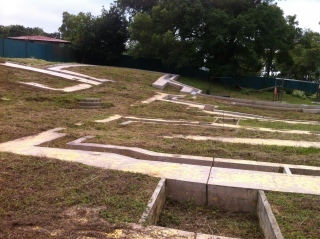 This is the story of an attempt to locate some of the hidden sites of World War Two in and around Singapore. This is also the story of the attempt to make a status of Singapore, as a nation, and its success in securing the awareness of the history for the generations to come. With an open mind and a sound desire for adventure, I have startet my search for on-site remains of battle sites and monuments, sometimes hidden in growth of jungle and sometimes in very well kept parks. Until the beginning of the 1800 century , <?xml:namespace prefix = st1 ns = "urn:schemas-microsoft-com:office:smarttags" />Japan had been able to keep the country closed to outside cultural and economic influence. Japan was a closed nation, which was strictly driven by the powerful Shoguns and their clans spread across the country. After repeated attempts to get the feudal nation to open its borders and accept trade with the outside world, America decided in 1858, to take matters into their own hands. American warships forced their way into Japanese harbours and demanded that Japan, as a nation, would agree to conduct trade with the outside world. It soon became clear to the Japanese rulers, that the world outside of Japan, was technically far more sophisticated than themselves, especially within military technology. Japan realized their need to modernize their industry in order to maintain their sovereignty and not end up like China, which had been divided by Western colonial powers and which, as a nation, had sunk to its knees. In the following 10 years there were ongoing internal discussions within the elite and it was finally decided to chose a suitable Shogun to be responsible for the modernization of the Imperial nation The west had forced their way in to Japan and the new Japanese leadership of the country was given the task of modernizing the industry and the development of the Japanese military. Gradually, as Japan developed and increasingly became a more powerful nation, it wanted to expand its borders and influence in the region. This not only to gain political power, but also to secure access to important raw materials for the growing Japanese industry. Japan had since 1858 felt that they had surrendered to the western colonial nations and they needed to stand up against foreign influence. In 1898 Japan defeated China and further surprised the west by defeating Russia in a battle in 1905. Korea was subsequently also defeated a few years later. There was a growing concern in the outside world, that Japan as a nation was becoming such a powerful nation that could not just be ignored. This view was especially shared between the Western colonial powers. When Hitler annexed Austria in 1938, things started to evolve in a direction that could support the further development of Japan. In 1940, Japan chose to become an Axe power along with Germany and Italy and the Third World War was a reality. Under the motto "Asia for Asiatics", Japan roared Asia and the Pacific. In Europe, one could not imagine that Japan could pose a major threat to the well-educated and technologically superior Western armies. This was at least the official position. But growing pressure from Hitler in Europe, where England had involved themselves in the fight against Germany on French soil, was making it difficult to devote enough military hardware to defend against the Imperial Japanese army, which increasingly posed a threat in the area close to the English colonies. In London, there was no doubt that the Japanese were planning to invade the Malaysian peninsula, in order to gain access to important raw materials for the growing Japanese industry. However it was felt in London, that the Japanese were not able to easily invade through the dense rainforest with armor and artillery, which led to the beliefs that the British forces would not need armoured vehicles to defend Malaysia and Singapore. But in fact it was more a matter of England not having resources enough to send either a large number of tanks or aircraft to Singapore or to have them send from their other colonies. Singapore and the Malaysian Peninsula were only in possession of 150 obsolete aircrafts in 1942 and Lt. General Percival had to play with the cards he had been given. A large number of newly enlisted Allied soldiers from England, Australia and India were sent down to Singapore shortly before the Japanese began their aggression down through Malaysia. 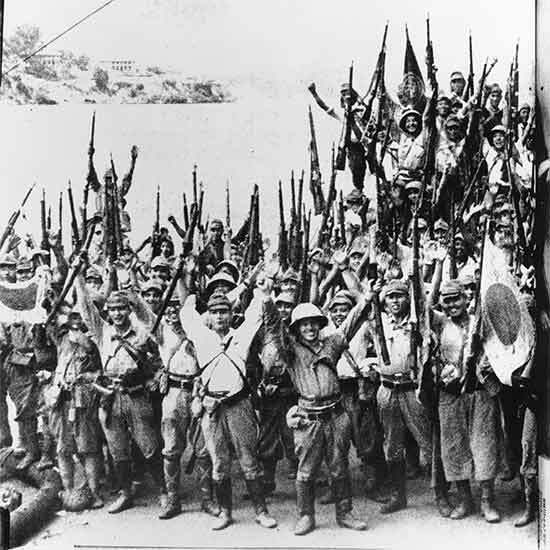 These weakly equipped and only lightly trained troops where overwhelmed by the Japanese Army and consequently needed to withdraw to Singapore in a final desperate attempt to defend against the aggressive and surprisingly advanced and technically sophisticated Japanese Imperial Army. Up to the great surrender under Lt. Gen Percival in 1942, can be written many heroic stories of unequal battles between novice Allied soldiers and war hardened Japanese soldiers. Everything went wrong in the defence of Singapore and many military and civilian lifes were lost. then click on this section to watch the Documentary "Japans War in Colour" - Complete Documentary. Since my arrival to Singapore, almost 2 years ago, I have tried to learn about WW2 in Malaysia and Singapore up to the great surrender in 1940. I have increasingly becoming aware that most Singaporians prefer to focus on the present and future and not deal much with the history in the region. No doubt that Singapore, as a nation since its establishment in the 1960s has become one of the most successful nations in the work and there can be many reasons for this looking forward more looking at the past and one element that might play a role is surely the significant cruelty that is a part of the regional history during Japanese occupation. I have tried to seek out the various historical sites and have previously written articles about "The Battle Box" and "The Ford Factory" in Singapore.. I have now decided to continue my search for other historic locations, which has been the scene of many a bloodiness. I have scheduled some visits to different historical locations in the area. One location close to The Ford Factory at Bukit Timah Road, where desperate battles took place prior to Lt. General Percivals surrender. Furthermore a visit to one of the machine gun pill box positions followed by a visit to a "Monster Gun" positions at Johore. 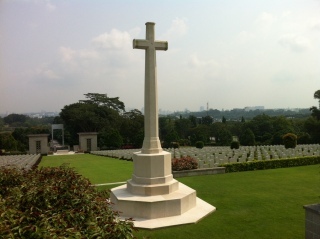 A visit to the Kranji Military Cemetery is also on my list of locations to visit. The sky is dark and in the distance you can hear one of the thunder frequent thunder storms closing in and you can feel in the air that heavy rain is on its way. However I have decided to visit the Batok Hilltop today. The Batok Hilltop is where the Japanese chose to erect a Japanese memorial for their fallen soldiers during the battle for Singapore. 500 Allied prisoners of war were ordered to build the memorial, which consists of 130 steps leading up to the top where the shrine used to stand.. During the building of the memorial, the allied POWs negotiated the right to find their own camrades in the jungle to have them cremated and buried in another location just behind the Japanese memorial. Initially the Japanese commander was against it, until he saw the propaganda value and accepted the project. In December 7, 1942, both the Japanese and Allied memorials were presented to the public with great propagandistic attention. Today, only what had previously been the foundation for the memorial stands and besides the platform is today a major broadcast station for Media Corp.Asia with wire fences, masts, watch towers e.t.c. None of the original memorial is left. All that's left is the 130 steps and a plaque at the end of the stairs. I did not expect much because I already knew that the memorial had become cleared by the Japanese when the tide of battle was turning and subsequently the memorial was removed by the British military in the 50s. But still with a bit of disappointment I went down the 130 steps to the parking lot. I had probably expected a little more than just a plaque. After all 500 Allied prisoners of war, characterized by malnutrition, disease and constantly moist heat, had build this memorial. They even had ventured through the dense rainforest to find their camrades so they could give them a proper funeral. The interesting part of the history is that the plaque was not set up before a visiting tourist, in a letter to one of the local newspapers, had expressed his surprise that they had not bothered to mark this spot of historical significance. Hereafter the plaque was setup short time after. The heavy rain drops are now falling and it is time to go for the next visit - one of the few remaining historic machine gun positions, close to the famous McRitchie Reservoir. After driving through the intense tropical rain, which made the traffic move in slow motion towards McRitchie Reservoir, the dark clouds finally pulled away and blue sky began to take over. The temperature had dropped a few degrees after the rain. According to my GPS, I was now in very short distance of the location of the historic machine gun position at Sime Road. However, I was a little confused when the GPS showed me down the road to the Singapore Island Country Club, which is only for members? Well, I had to rely on the GPS and as there was no other entry opportunity to the area, I had to obey and began to drive down the long and beautiful road with a golf course on the right side of the road and beautiful villas on the left side. I noticed that one of the old "Black & White" houses was of a size that could indicate that this was the location of "The Combined Army and Air Force Operational HQ". Just before the entrance to this fashionable villa, I saw a concrete structure out in the scrub, which could look like a machine gun position. But could it be that shown on the map as it was well covered by the vegetation. I continued further down the road, while thinking about Lt. General Percival, who had presented a plan to make a desperate counteroffensive during one of the last days before the final surrender. His officers, however, had voted him down as the civilian casualties had become so large and the water supply got to a minimum and at a life-threatening level for all Allied troops and civilians. To restore water supply was his goal as this would allow the Allied forces to maintain the resistance against the Japanese while they restored the communication lines, which had collapsed in several places which combined with misguided orders had left the allied forces very weak. Could this location have had a strategic importance as there had been some fighting in this area though not to the same extent as the area around Bukit Timah? The question was left unanswered. I continued to drive up towards the entrance to the Singapore Island Country Club. After a little more driving, I reached the guard building at the entrance. I thought that the security guard most likely knew more and could be of good help. I parked the car and walked towards the little hut with all windows wide open to cool down the temperature inside in the humid dazing heat. "Sorry, I dont know anything .. I am from Malaysia " - the young Security Guard said. I was very tempted to tell him, that the world history, especially for this region also applies to Malaysian citizens of all ages! Instead I smiled as friendly as possible, while I made him aware that I would make a little stop on the way back to the main road for me to take some photos of the Pillar Box. On the way back I parked the car just next to the tense vegetation next to the pillar box. Behind a hedge and dense bush, I found an old sign with a short introduction to this machine gun position, which had been built in 1938 by the British Military Authorities. There was no further information whether there had been any fightings between the Japanese and the Allied troops on this very location. In the intense tropical heat, I stood and reflected a bit over things. Not only had the Japanese defeated the allied forces around the Malaysian Peninsula in 1942, but now, 72 years later, the rain forest with its dense vegetation was almost winning another battle covering all remains from a time long time back. Unless someone, including the Singaporian authorities, felt that the history had an importance as a guidance looking forward, basically following the old saying: �You need to understand the past if you want to plan for the future�, the remains from the past, will will soon be hidden for posterity. 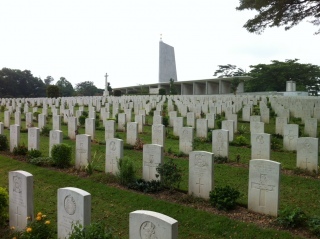 On my list of places I had planned to visit, was the �Kranji War Cemetery� and it would be my goal for todays "expedition". It's Sunday and early morning. My family are still at sleep and I hasten to take some quick breakfast so I can go before it gets to hot. Kranji is located in the northwest corner of Singapore adjacent to the new Singapore Turf Club, where the gambling Singaporians play on horse races. A hot day is waiting ahead, however right now the temperature is comfortable and I set off. After about half an hour I reach the small parking lot in front of the cemetery. I'm the only one in these early hours and I have the whole cemetery for myself. In the background I can hear the traffic that slowly starts to intensify. But even closer I can hear a rooster crow. This is not an every day experience here in Singapore and strange enough it makes me feel at home. Most likely because it is so different to the big sizzling, hectic and modern city not far away. The finest green lawn covered with white tombstone appears after I have gone through the great and impressive gate to the cemetary. Just like the big war cemeteries in Normandy and the Philippines, that I have visited previously, this is a calm and sort of sad location. A monument of the ultimative losses that any human can offer - death. I begin to take a closer look at the engravings on the gravestones. It quickly becomes quite clear that many very young lives were lost here in the hectic battles with the Japanese Imperial Army, not just in and around Singapore, but throughout the entire region. Everything is very well maintained and it more than makes up for the disappointment from some of the other locations that I have visited here in Singapore. It dawns on me how big the cemetery is. Subsequently, I find out that there are graves of soldiers and families from other conflicts up to the 60s, but they have been located in their own section of the cemetary. 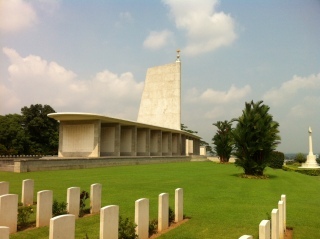 However, the big main section of the cemetery in front of the entrance, includes casualties of the conflict in Singapore in 1940s. A touching and thought-provoking visit and I am pleased that this visit does not offer yet another disappointment to me. After enjoying the peaceful atmosphere, at Kranji Cemetary, it is time to move on to the next point of visit, the Johore Gun Battery. I set the GPS and away it goes. The temperature is on the way up and there is now significantly more traffic.. After about another half hour, I am now closing in on the Changi Airport. The GPS leads me through a residential area with small 2-3 storey villas and many dead end streets. I wonder if the GPS is wrong. Is there really a historical landmark here in this area with these small roads and with so many speed bumps. 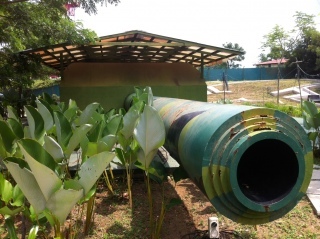 I know that this gun position is located close to the Changi Prison, which is close to the airport and that, by coincident in 1991 during a clearing of the area, they found the foundation of this huge cannon position. This canon, was able to send grenades far away, that could in fact penetrate even the thickest armored warships. The complex consists of an associated piles of ammunition storage and a maze of underground passages. As the Allied forces were about to see the fortunes of war changing to the benefit of the enemy, the Allied forces secured that the gun position was destroyed so it could not be used by the Japanese. After the war, the underground bunker was sealed and forgotten until it was found in 1991. It is claimed that the discovery of this bunker is one of the greatest WW2 discoveries of recent times, so my expectations were high for what awaited me. On the way down a small road with percussion arrangements fences on both sides of the road, I see in a little weird lighting, a big cannon protrude through the undergrowth ...... but instead of a historical landmark, it looks more like a bar or caf� next to an auto dump. This can not be a historical place, so I continue driving down the street.. Gradually, I have come out of the area and the GPS tells me to turn around, so I have apparently passed the location. U-turn and back again ..... and this time I go for the funny little cafe, which turns out to be the actual place for this gun position. Since the found in 1991, a replica of the super canon has been build on the exact location. But it is obviously turning into a kind of bar, cafe with new modern furnitures. The replica of the big cannon is now in the middle of the cafe and surrounded by high fences in to the prison and covered in vegetation, which clearly takes over very fast in the tropicals. In a small parking lot in front of the cannon, there is a series of old vans that are not able to run under their own power, or put in a less nice way.. it looks like a car dump with vans intended for scrap. I squeeze in my car between the old vans. Some concrete constructions on top of the soil indicate the design of the bunker below the surface, which was reopened in 1991. It can be seen that the vegetation has been cleared recently, and it smells horribly of rottenness. There is no doubt that the owner of this bunker is not earning his money to showcase the bunker and the big cannon, but serving in the adjacent cafe, which has the name "Bunker Cafe and Bar". You can see the entrance to the sealed bunker, but that is closed with a padlock. Since the cafe looks more than closed here on this Sunday morning, I decide to quit for today and head home to reflect on the days visits. I decide that one of the next points of visit on my trail will be one of the local museums, as one thing that the Singaporians are very good at, is their exhibitions� comfortably in air condition, far away from the real, hot and humid world with bugs and salty sweat dripping down in your eyes. Maybe this is the reason that these different on-site locations are not well visited and maintained? The number of visitors are simply to few. No matter what, I have no intention of giving up finding interesting historial locations. So I decide to plan for a visit to the Changi Prisoner of War Camp with its famous reconstructed chapel, which was the natural center for many prisoners of war, a center in a sad and monotonous daily life in Japanese captivity.